CES 2013: Intel announce new smartphone, tablet and ultraportable processors! 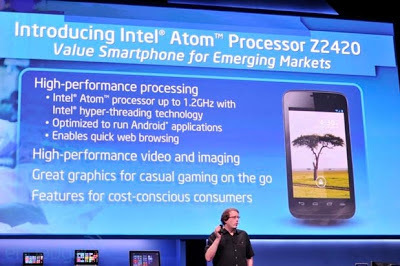 Intel announces new Lexington Atom chips for 'value smartphones'! Firstly, Intel started off by announcing a new smartphone platform designed specifically for emerging markets. This chipset is designed for Android and its apps and it can run at any speed up to 1.2 GHz, there's also the nice touch of having Intel's hyper-threading technology. The processor has support for a pair of cameras which will be specifically 5 and 1.3-megapixels and they can take burst shots at up to 7 fps, you'll also get video decoding and encoding at 1080p and 30 fps and PowerVR's SGX 540 GPU will take care of graphics. On the connection from you can get HSPA+ data speeds, microSD card slots, dual SIM support, FM radio support and WiDi streaming! Intel has already struck deals for this processor to be embedded in handsets made by Acer, Safaricom and Lava, but we're not sure any of them will be landing Europe or North America. 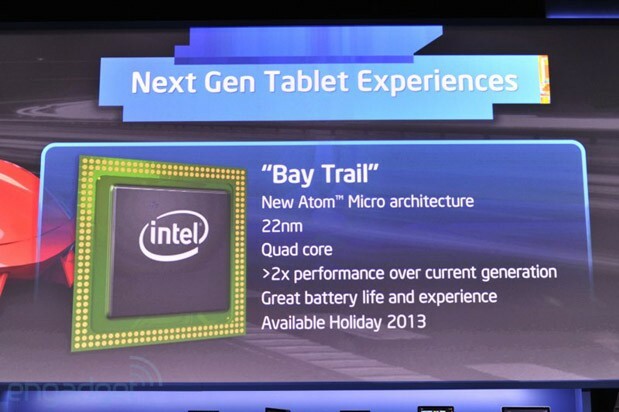 Intel launches 'Bay Trail' Atom chips for tablets! So if you have a new smartphone platform, it would seem silly not to have a shiny new tablet option too! Intel seems to be taking the line that smartphones don't need to pack the same punch as tablets and so with the new Bay Trail chips we're looking at the best of the best! Surprisingly Intel weren't too expansive about these processors, probably because they won't be arriving until later this year, but we do know that they utilise a 22nm manufacturing process, they're quad core and they should be relatively frugal if they want to compete with the current crop of ARM-based processors! Looks like we'll have to wait until later in the year for more details on these! 7 Watt Ivy Bridge chips for Ultraportables and Tablets! So what better way to start a year than promising something which you promised this time last year! Some of you may remember than Intel promised you could get 'all day battery life' last year and well we couldn't. But, hopefully that's changed now with these new processors. The new Ivy Bridge range, which were codenamed 'Haswell', offer a new lower power usage which can even draw as little as 7 watts of power. That's down from the 17 watt low-power chips we have at the moment! Intel claims that these chips will allow use to have thinner and lighter tablets and laptops with longer battery life, which would be absolutely great! Intel also promises performance levels which are up to five times the performance of the Nvidia's Tegra 3 SoC, which itself was no slouch! Intel has a reference design built on one of these processors which you can see here! New Intel® Atom™ processor-based platform aimed at value segment of smartphone market with support from Acer®, Lava International* and Safaricom*. Highlights forthcoming "Clover Trail+" platform aimed at performance and mainstream market segments. 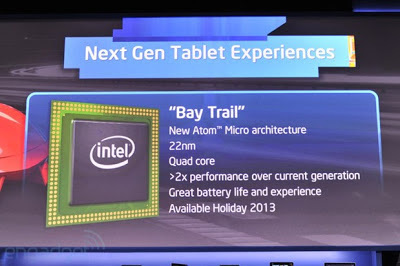 Wide range of Intel-based tablets running Windows 8 now available on shelves and online; First 22nm quad-core Atom™ SoC for tablets expected to more than double the computing performance of the Atom™ Processor Z2760 platform; available holiday 2013. Lower-power Intel® Core™ processor lineup reaches as low as 7 watts, enabling thinner, lighter, touch-based Ultrabook convertibles, detachables and tablets. 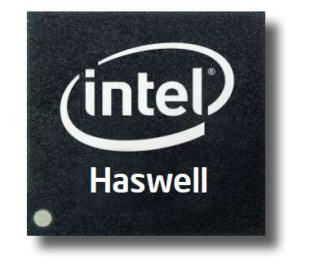 4th generation Intel® Core™ processor family (formerly codenamed "Haswell") will enable a broad new range of Ultrabook convertibles, detachables and tablets with all-day battery life; the biggest battery life gain over a previous generation in company's history3. INTERNATIONAL CONSUMER ELECTRONICS SHOW, Las Vegas, Jan. 7, 2013 – Intel Corporation executives held a press conference today to outline a plan to accelerate new mobile device experiences across the company's growing portfolio of smartphone, tablet and Ultrabook™ offerings. The new platform brings Intel's classic product strengths to this fast-growing smartphone market segment, including impressive performance for quick Web browsing, and a great multimedia and Android1 applications experience. Speaking to a robust product roadmap and growing ecosystem of tablet and tablet convertible devices running on Intel technology, Bell reinforced the wide range of tablet designs based on the Atom Processor Z2760 running Windows2 8 now on shelves and online from OEMs such as Acer*, ASUS*, Dell*, Fujitsu*, HP*, Lenovo*, LG* and Samsung*. More tablet designs are scheduled to ship over the coming weeks. Enabling a mobile, connected and full Windows2* 8 experience, the Atom platform boasts all-day battery life and is more power- efficient than competitive offerings. Advancements made in the way consumers will interact with their computing devices were also demonstrated, including natural and more immersive interaction experiences using a 3-D depth camera. Intel showed applications running on an Ultrabook in which objects can be manipulated naturally with free movements of the hands, fingers, face and voice. One application that was demonstrated can be used for enabling new and immersive video collaboration and blogging experiences. These were all enabled using the Intel® Perceptual Computing SDK Beta. This year, Intel expects more Ultrabooks and all-in-one (AIO) systems to offer applications for voice control (Dragon Assistant*) andfacial recognition (Fast Access*) for convenience and freedom from passwords. 2 Windows is a registered trademark of Microsoft Corporation in the United States and other countries. 3 4th Generation Intel Core processors provide 3-5 hours of additional battery life when compared to 3rd Generation Intel Core processors, based on measurement of 1080p HD video playback.